Three word summary: Titanic in space. If you want to read a book about a giant ship falling out of hyperspace and crashing, killing all but two people, it's not wise to do so on (a) a 14 hour flight over the ocean or (b) an 11 day cruise. For better or worse, that's exactly what I did. Lucky I'm not squeamish. These Broken Stars is a perfect combination of enchanting writing, intriguing characters, forbidden romance, and a suspenseful plot. I find it hard to define good writing. Sure, there's flowery prose and well-constructed sentences, and there's a place for that. But that doesn't always equal good writing. A well written book has an intangible "it" factor. There's something about it that makes you keep reading. It flows well. The writing in this book kept my eyes locked to the page. The authors had a way of playing with time that revealed certain aspects of the plot ahead of time, but in no way lessened the tension. The writing is also very quick. The chapters are short and the prose is basic. This allows the reader to lose themselves in the story without getting distracted by the words. Lilac is a brilliant character. She comes off as a spoiled princess but her intelligence, ingenuity, and grit make her far more than the stereotypical weak girl who needs a boy to rescue her. On the other hand, she's not inhumanely strong. She needs help. She's not accustomed to wilderness survival. Her stubbornness works to her disadvantage. These contrasting characteristics make her three-dimensional, far more than many YA characters. I liked Tarver, although stepping back from the book I have more reservations. He is brave, independent, and brash. He helps Lilac but also doesn't treat her like a weakling. Under that hard soldier exterior though, he's mourning the loss of his brother and has the soul of a poet. This is where I roll my eyes a bit. Tarver feels like a trope. A variant of the bad boy with a sensitive soul. Authors write characters like these because they think that's what readers want in a boy love interest. And you know what, it works. I fell for Tarver...but there was a part of my mind that wondered if I was being played. These Broken Stars in a love story couched in science fiction. It gets into topics such as hyperspace, planet colonization, and other sci fi basics, but its heart is centered around the growing relationship between Lilac and Tarver. I like that the characters didn't get together too quickly. Too often, a plot gets boring once the romantic tension of "will she or won't he" is gone. The authors prevented this by sticking in some huge surprises for the happy couple that kept the reader interested. On the other hand, reading the story from alternating points of view made the romantic tension frustrating. We can clearly see the characters' feelings for each other growing, yet their outer reactions were harsh and sarcastic for far too long. I wanted to knock their heads together and tell them to stop being such jerks and actually say what they were thinking. 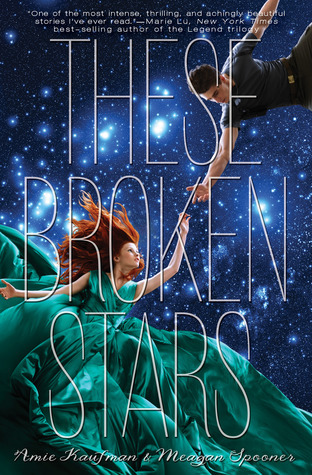 The few flaws of These Broken Stars is far outweighed by the wonderful story. The book brings Lilac and Tarver's story to a relatively satisfying conclusion while leaving many open questions about why the ship crashed, the planet they landed on, and Lilac's creepy father. These will be answered in future novels, which will be companion stories focusing on new characters. A smart move, I think, rather than drawing out Lilac and Tarver's story until it's overdone. The first book of the Starbound series is a must read for any sci fi and/or romance lover. I have this. Now I need to read it, lol. Maybe later this week . . . b/c really, what part of "Titanic in Space" is not awesome? Well, at least you weren't on a spaceship. That would have really freaked you out!! Highly enjoyed this story. Yeah, probably not the best book to read whilst in a plane:) So glad you loved this one though, I was a huge fan as well, and can't wait to see what these two come up with next. I don't usually like sci-fi settings but I really enjoyed this book because of the pacing and characters. There were a few flaws but I let most of it go because overall this was a lot of fun to read. Sounds amazing. Titanic in space? I'm not ashamed to admit I still love everything Titanic. Can't wait to check this out! Great review! I really enjoyed this one, and I am glad that you did too. I am looking forward to the next book. Great review. YAY! Love this one as well. The ending is well done. Nice review. Heh, you read this while on a plane and a ship? You're a braver person than me! So glad to hear you loved this as well, despite some minor flaws. It was such a great reading experience, but I'm glad Lilac and Tarver's story won't be drawn out either. Bring on more intrigue with different characters! I can't wait. LOL. You definitely didn't pick the right time to read this book! :) I'm glad that you enjoyed it anyway. 11 day cruise!! OK WOW! I went on a 7 day cruise and thought I was going to die. It was way too tight quarters for me and WAY too crowded. I wish I would've had a better time. I do want to read this book and your review makes me want to even more. I still haven't had a chance to read this one. I put it off for a while because everyone was raving about it and I didn't want to have my expectations sky high. I hope to get to it later this month. Glad you enjoyed it despite the frustrating romantic tension. I have to admit, I was on the fence about reading this. But I might actually read it just to see how the writing style is.